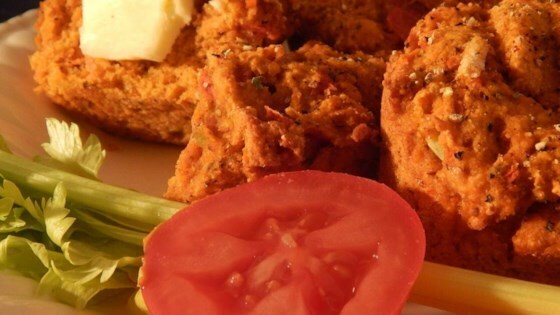 "Savory muffins with no sugar, only yummy vegetables. Great as a more flavorful 'biscuit' for 'biscuits and gravy'. Good any time of day! You can substitute garlic salt or seasoned salt for the salt if desired." Whisk flour, cornmeal, baking soda, baking powder, chili powder, oregano, and salt together in a large bowl. Stir carrots, tomatoes, celery, and garlic into flour mixture. Whisk tomato soup and olive oil together in a separate bowl; stir into flour mixture until batter is just combined. Spoon batter into prepared muffin cups. Sprinkle each muffin with black pepper. I significantly reduced the amount of baking powder and soda and they are yucky. They are horrible and taste like straight baking soda. The flavor is awful, which is probably due to the insane amount of baking soda.